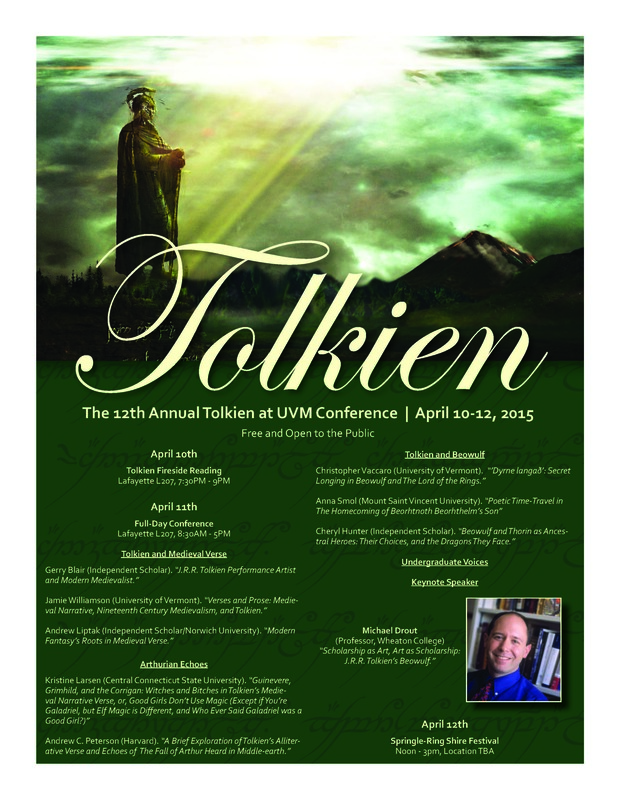 The schedule for UVM’s upcoming Tolkien in Vermont conference has been released! The conference is an annual, scholarly examination of J.R.R. Tolkien’s legacy, and it’s an interesting way to learn some new things about the author who created Middle Earth. This year’s theme is Tolkien and Medieval Verse. Friday evening Tolkien fireside readings 2015, Lafayette Hall L207: 7:30 – 9:00 p.m.
Lafayette Hall L207: 8:30 – 5:00 p.m.
I’ll be presenting on Saturday morning with a look at how Modern Fantasy (spearheaded by Tolkien) emerged from much older stories. Full details can be found here. This entry was tagged J.R.R. Tolkien, UVM. Bookmark the permalink.